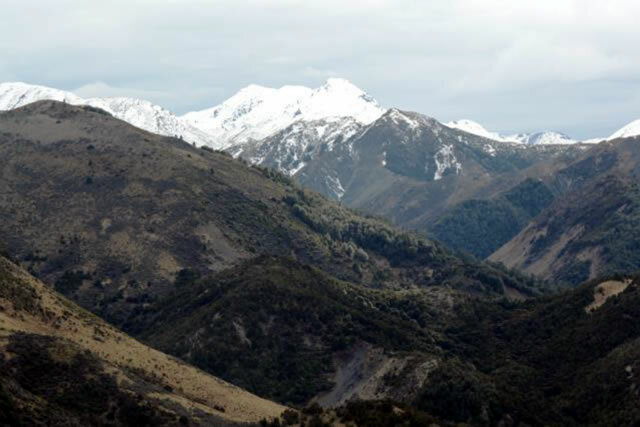 I was bouncing along a track in Hanmer Forest in North Canterbury looking up at the snow covered tops above the pine forests talking to John Angland the co-owner of the Hossack Station about the area. I thought to myself how good it was to be back here. I left Hanmer Springs 25 years ago to move to Australia and it was great to be back and headed for a high country station I had shorn sheep and hunted on in the mid to late 80's. 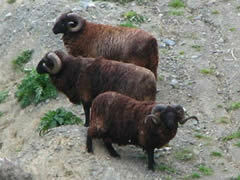 The station is a mixed grazing operation running cattle and sheep. It is also now a guided hunting operation catering for free range and estate hunting, as well as fishing and gamebird shooting. 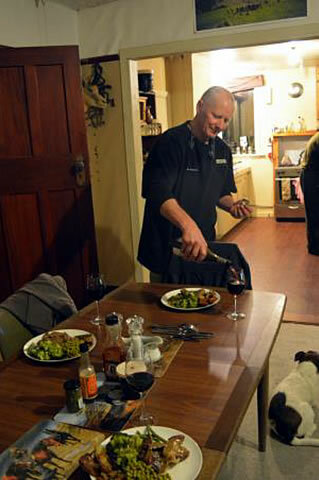 John runs the hunting operation on his statin because of his love of hunting. 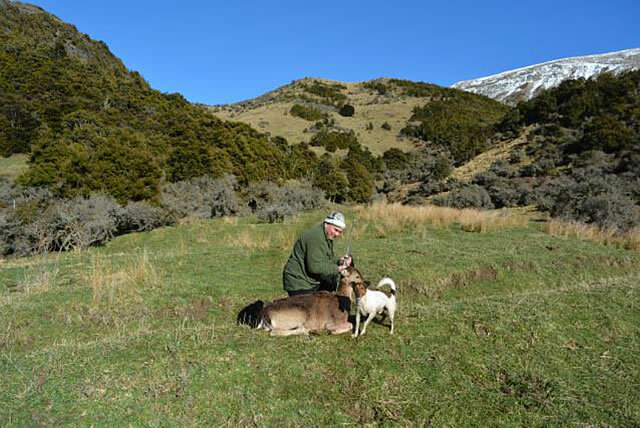 I had organised with John and paid for a free-range management hunt for a non-trophy red stag so I could get a bit of venison for my whanau back in Christchurch and spend a few days in an old stomping ground. I was also keen to get out and possibly do a bit of game photography. 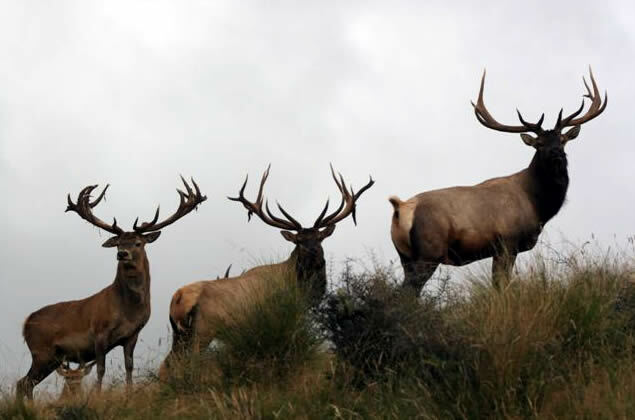 The Hossack has red deer, fallow deer, chamois and pigs running free range as well as in the estate which also has odd wapiti and Arapawa ram. The back of the The Hossack Station in North Canterbury. 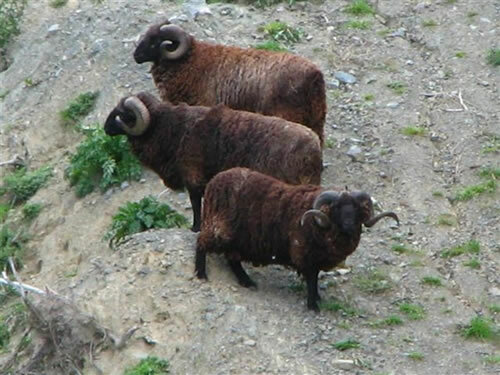 Ideal country for chamois, deer and pigs. We arrived at the station homestead late in the afternoon, where we met John's mate Pete who had come up for a few days with us and had volunteered to do a bit of cooking while we were in the hills hunting. The old station homestead was unchanged from 25 years ago and was warm as toast from the fires Pete had going and there was a hot brew waiting for us. John then asked if I wouldn't mind going up the river with him and shooting any pigs or hares we saw because of the impact they were having on some of the paddocks and fodder crops for the stock and possibly shooting a fallow doe for meat. Would I mind? Are you crazy? A nice fallow doe taken for meat. The shot was taken from the point and the animal was shot midway up the hill in the centre background. 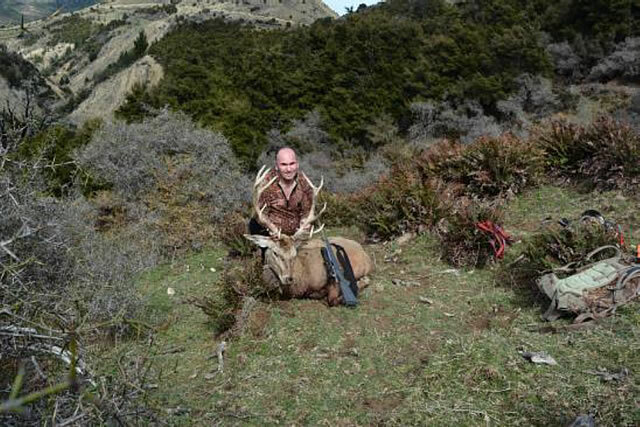 We packed our firearms into the vehicle, I had my Kimber Montana in .308 topped with a Leupold Boone and Crocket vari-power scope, it's a lovely light and accurate firearm and my favourite for carrying around the hills in New Zealand for tahr and deer. 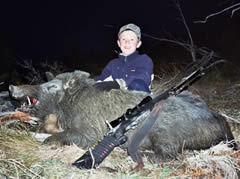 John grabbed his bull-barrelled Remington .223 with a moderator. I was looking forward to the chance to use the .223 with the moderator to see how it would go. I wouldn't be disappointed, it is a sweet and accurate rifle and the moderator makes it feel and sound like a .22 magnum when you shoot it. I long for the day when sensible firearms legislation returns to Australia and we can use them over here. If the Shooters and Fishers Party keeps going like it is and hunters support it, it may not be that far away. We headed up the river on the station track which took us onto a number of terraces that had winter feed. It wasn't long and we started seeing pig sign and a few hares which were dispatched with the .223 and put in the back for dog tucker. I said to John that back in Australia I would be dressing them to eat. He said that with the number of deer, pigs and chamois around these days they didn't need to muck around with them. But the hares still needed to be shot as there certainly were plenty everywhere we drove and they had an impact on his winter feed for his stock. 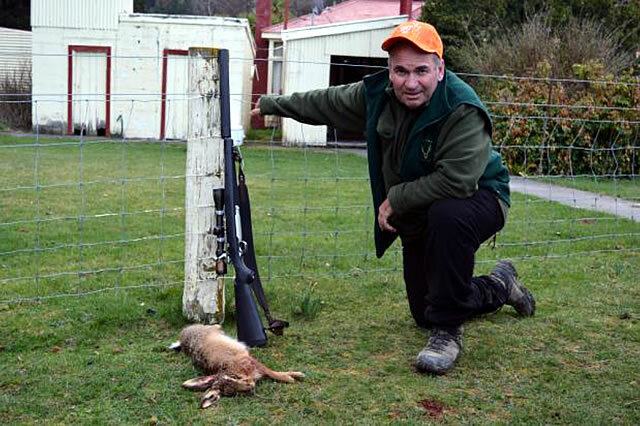 (and sensible) option for hunting hares and deer in New Zealand. A few kilometres up the river we stopped and walked down to a vantage point over the river flats to wait and see if a pig or a deer came out just before dark. I had my Swarovski spotting scope, so I set it up on its' tripod and got the camera ready to attach if any game photo opportunities presented and began glassing the opposite faces. 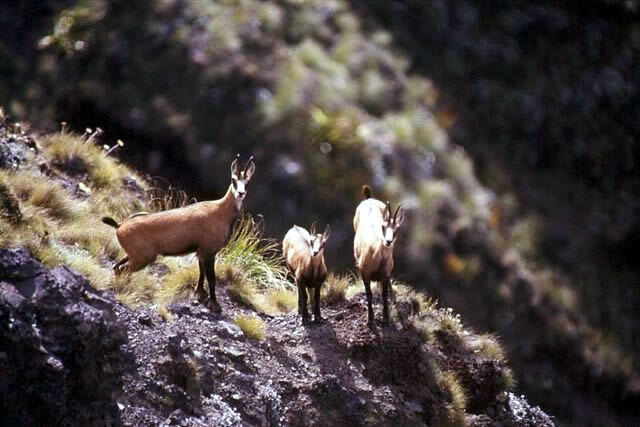 No deer or pigs were seen but a nice chamois buck fed out onto a steep rocky gut about 200 metres above the river and 500 metres away directly opposite us. It was great watching this beautiful animal feed and move about. I got a bit of video footage, but the light had faded too much for a good still shot. We headed back down river, putting a spotlight over the flats and terraces and shooting a number of hares. Back at the station we had a great feed of roast venison waiting for us and John made up a sensational entre of smoked rainbow trout that he had caught at Lake Taupo the week before. We then hit the sack for an early start next day. The following morning a good hard frost greeted us as we headed up the river towards Middle Hut, aptly named as it is in the centre of the station. It had been raining and snowing for the previous week so there was a good chance the deer would be out warming up on some sunny faces. We saw a number of mobs of red deer but the 2 stags seen would have been trophy class, not management stags. We also saw a number of fallow deer and a couple of pigs. 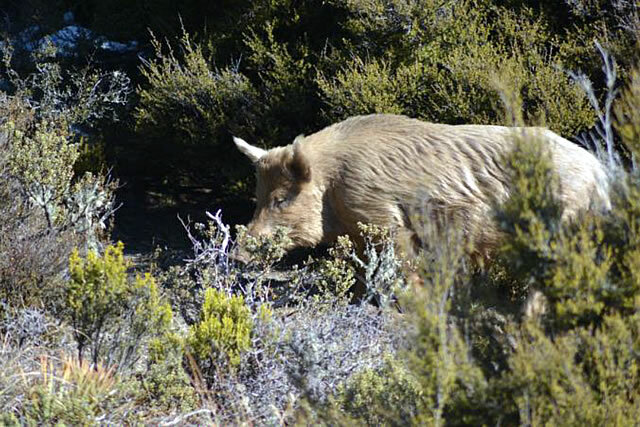 A nice boar stalked and photographed while climbing a ridge to look for some chamois to photograph. At around 10:00 am we saw a couple of fallow deer about 200 meters above the track. John asked if I would shoot one for meat for them. So I got into a prone shooting positon on a nice rise with the daypack to rest on. I asked John to range them with his rangefinder and thought I heard him say 215 meters so I lined up the second cross hair on the reticle up on the doe's chest and touched off the shot. At the shot the doe lurched down to her right and disappeared and Pete said she's down. We went up to the spot and she was lying about 10 meters from where she had been shot. The shot was a little lower than I thought as the range had actually been 259 meters. The doe was dragged back to the vehicle gutted and tied onto the bull bar for the trip back to the station chiller. That afternoon we headed out to another area and saw a very nice 10 Pointer which would have passed as a management stag as it had no brows. 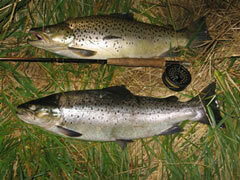 Unfortunately it fed over into a steep matagouri choked gut and was not seen again. A number of fallow deer and red hinds were seen but no other red deer stags were to be had. 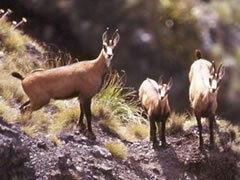 A big, but un-even Fallow buck spotted while digiscoping a chamois buck. It was stalked and photographed in the bottom of a manuka and matagouri filled creek. 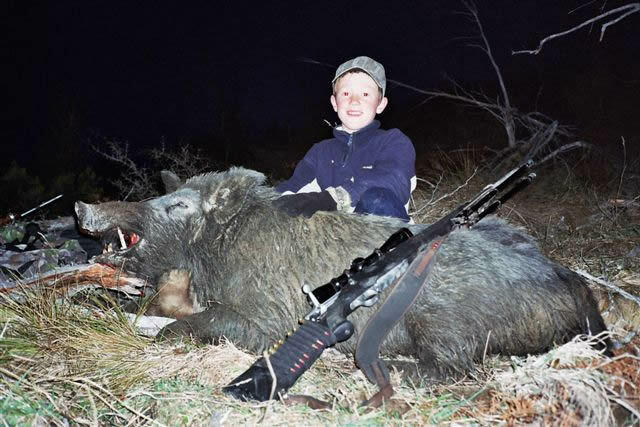 The afternoon was filled by me shooting one medium sized sow and stalking in and photographing a big old blonde boar which we left alone for John to bring an American client back on at some time in the future. We shot hares on the way back to the homestead in the dark where Pete had cooked up another venison dish and John topped it off with a salmon and whitebait entre. 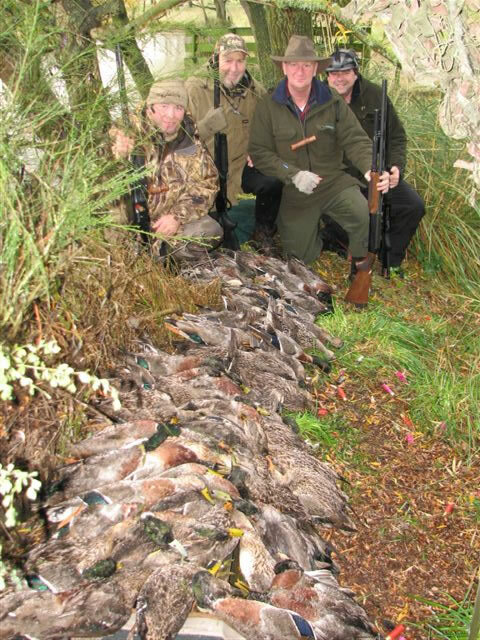 With that, the hunting, the good NZ wine and the Rugby World Cup on the television I was in Kiwi nirvana! a good NZ red and World Cup rugby on the TV = Kiwi nirvana. 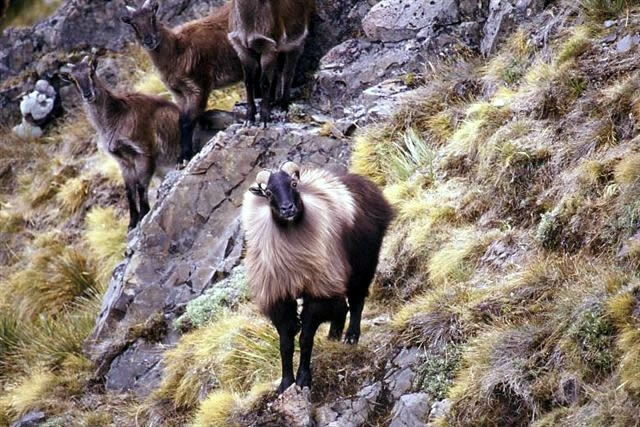 The following morning we headed out to another part of the station and saw quite a bit of game and photographed and video, a couple of chamois bucks, a fallow buck with a great palm on one side – weak on the other, and a number of red stags. Finally we came across a small group of stags one of which John said was a management stag. 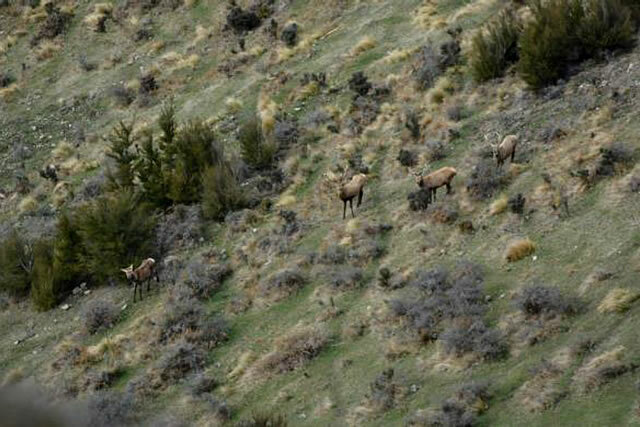 The stags were moving across the opposite face which John ranged them at 310 metres. John asked if I wanted to have a shot. So I set the daypack up again on a small matagouri bush. The stags had now moved up the face and John gave me the range at 369 metres. I took a couple of deep breaths, line up the third cross hair of the reticle on the stag's chest and touched off the shot. The stag went staggered to the right, carrying its right front leg. I fired again and the stag went down in the matagouri and manuka. 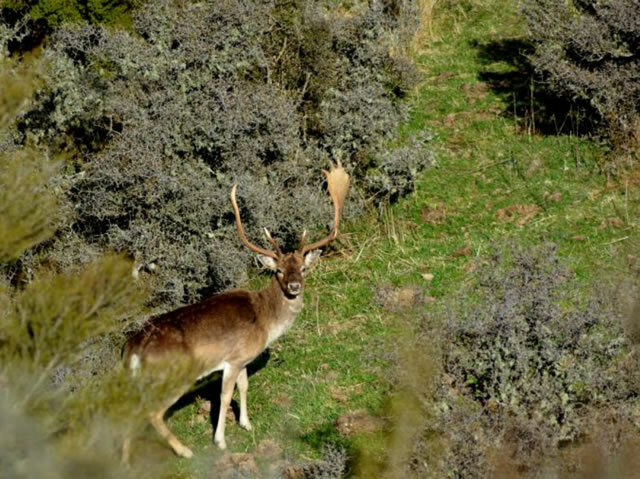 was taken as a management stag. at 369 metres from the opposite face. We climbed back up to the vehicle drove around the valley and got to within 300 meters of the stag. A steep climb and a quick search and John's Jack Russell terrier located the stag which was lying under a bush 5 metres from where it had been hit with the first shot. I was very happy with the performance of the Kimber as well as the 12 point stag I had taken. A few photos, a quick butchering job and we packed the meat and head back to the car where John had left a beer to cool in the creek for us. 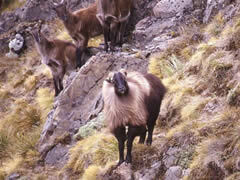 On the way back to the homestead we saw a mob of red hinds and John asked if I would shoot one for him for meat. I used his .223 to take the hind with a neck shot at 180 metres so that we could recover all the meat. The hind was duly recovered, field dressed and tied to the bull bar for the trip back to the homestead where it was hung with the fallow doe and legs from the stag. 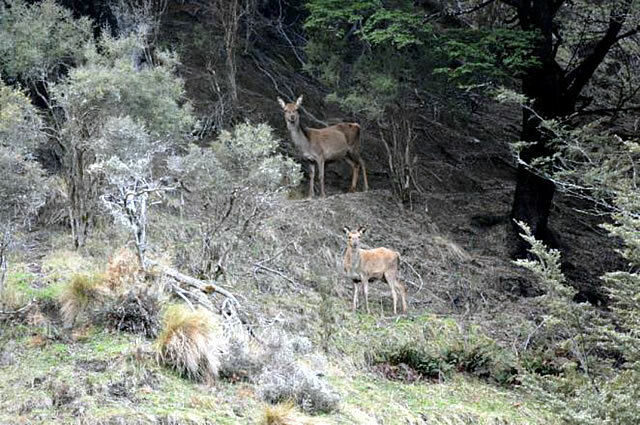 A hind and yearling photographed while looking for a stag. 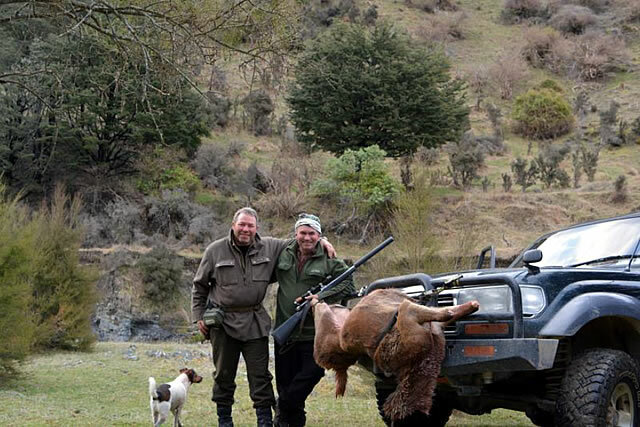 The amount of game in New Zealand is much higher now than 25 years ago, mainly as a result of less helicopter hunting operations. The following day we butchered up the meat and put it in a couple of "Chillie Bins' for the trip back to Christchurch. What a trip this had been for me, re-visiting an area I used to live, work and hunt in and seeing, hunting and photographing a variety of game. One of the best parts of the trip was doing it with two great guys John and Pete. 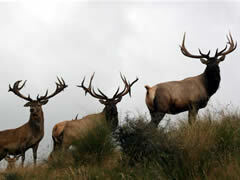 I'm looking forward to going back in a couple of years and hunting a stag in the roar. Brian and station owner John Angland after recovering a red hind. 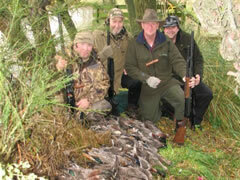 John is a passionate hunter and does the guiding mainly because of his love of hunting.